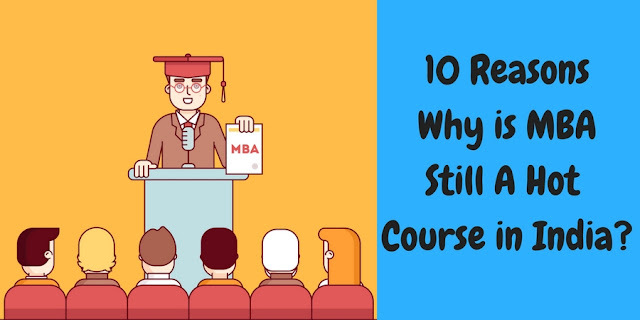 10 Reasons Why is MBA Still a Popular Course in India? This goes without saying that MBA is indeed the most preferred post-graduate degree program in India and the increasing popularity is a hard evidence of the same. Every student is slogging it out and is repeatedly yet courageously giving numerous examinations in order to land in a recognized B-School. However, the fight does not end at making into a prodigious B-school but begins afterward which starts with electing a valid MBA degree. Some who can not make it attend regular classroom MBA courses prefers to join an online or distance education MBA course. Still, all of it is worth the struggle and highlighting the reasons why MBA has a proclaimed love amongst students, we here share our directory of reasons. Arrange 5 minutes and read on! CAT examination is appropriately structured for engineering students. Since the past decade, the perceived benefit around the degree and placements are effective and prompt which helps MBA stand out. CAT covers Aptitude, Maths, English, and Reasoning which nearly every student has a hold on. Speaking factually, nearly 28 percent IITians are accomplished in these subjects and pursue MBA as a postgraduate degree. People who join a full-time job after their graduation prefers to go for an MBA degree program through distance education mode. Many top business schools in India also offer an MBA degree program through distance learning mode. Every career begins with an operational role and with consequent promotions, hard work and program upgradations, the next position clearly comes out to be under management umbrella. This upgradation takes straight 5 or more years which means that the initial years are gone in strangling with the base level profiles which offers more struggle than a validated learning experience. Unique traits in this performance oriented world is an integral factor which is why a more strategic decision is to opt for an MBA degree and hence the current following. Any MBA degree polishes the students with incredible knowledge that can make him/her a strategic consultant for several companies. The interactions and intellectual debates with any of the industry specialists or professors in any B-school makes an MBA aspirant a prodigal accomplisher. MBA lays the foundation for cracking any business code or help any business achieve an astronomical level of existence in the industry. A flashy MBA degree is not all about knowledge, it’s about networking or learning to network with the most smartest and versatile talents all under the same roof. B-schools are always regarded as the group of high achievers, because nearly every student has given a series of highly anticipated examinations like CAT, MAT or whatsoever. This group of achievers are future CEOs or great business leaders. MBA is all about learning about the advent, stagnancy or fall of business from live examples. Every MBA degree teaches students a real-time analysis of what happens to a business and on the basis of their procured market research and analysis, these students become consultants. Nearly every MBA student is involved in creating market reports, manage project deployment, analyze the future of a project or business and then input some notes further releasing the final strategy. MBA indeed is the most colored feather in the cap of any individual carrying a valuable set of degrees. Plenty or nearly every recruiter knows the value of an MBA gained from a high level institute, the cost involved in attaining it and more the struggle meter of the student to grab that position. To be more precise, an MBA degree achieved from a famous B-school like IIM or ISB, holds a brand value which is irreplaceable by any other degree so far. MBA degree is just like gold and if accomplished from a renowned B-school it gives any student a certificated hallmark signifying that he/she is competent enough to become a successful leader in near future. MBA is a ticket to step out of the country and make highly admired countries like Canada and Australia a future home. A recognized MBA degree from Stanford will make any student know the foreign market and the international business structure. MBA aspirants from prestigious universities like Harvard and Oxford makes them an achiever in all dominions. Getting an entry into any MNC as a consultant or an International business strategist becomes an easy breezy task. The kind of exposure gained at working on such a position close to the stakeholders or the primary managerial level people is amazing. Learning facts and figures from books is a secondary achievement while pursuing an MBA degree. The confidence gained and the level of interaction involved which makes any student affirmed in his theoretical learnings is what can be considered as a massive realization. The entire classroom experience, case studies, and peer-to-peer interactions are what radically changes the perspective of any student. At the end, self-learning or self-evolvement is the greatest asset any student can have. Unlike engineering or any other degree that gives only single digit salary package, MBA is the god of salary packages. Anything starting from 30 lacs to an indefinite number is what many MNC are offering to management students these days. The value of the package is high, without a doubt and the level of position is an another starry factor attracting MBA aspirants these days. Distance education has been a plus for a career growth as professionals and students can pursue an effective 9 to 5 pattern. The options for job increases and students can implement theoretical knowledge while working. This gives a steady growth to students as the bandwidth of practical knowledge increases and the scope of error decreases. These distance learning programs are designed especially to enable students to seek qualification offered by popular and recognized B schools and delivered locally. The programs may vary from one business school to the another and from one country to another country. The best part of these distance learning programs is that the online elements, teaching modules, classroom style teaching, video learnings and tutorial chat rooms. The help guides available and immediate student assistance makes the work easier for the students and professionals as well. Not only students but professionals who wish to keep their jobs and learn while they work find distance learning the best option. It's an added advantage that the distance learning program is offered by recognized B schools as the combination of an MNC job and a degree from a well-acknowledged B school is effective to fetch a high profile job. MBA demand is an effect of the rapid increase of jobs and the desire for knowledge pack along with a well-proven degree is an added advantage in terms of salary and exposure both. The salary packages offered in case of both distance learning and the full-time course is almost similar provided that the course is from a recognized B school which has a reputation of brilliant placements in top notch companies. 1. Which MBA for What Profession? 2. How to Choose Best MBA Specialization for Yourself?